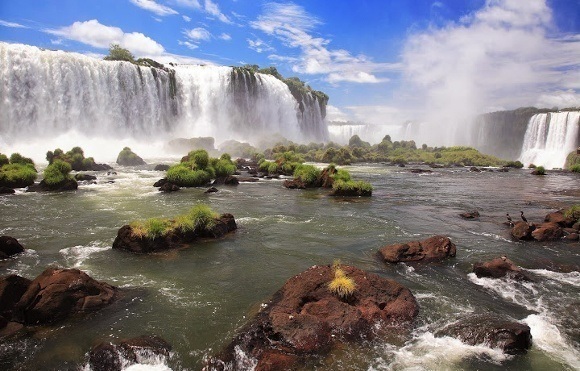 The Brazilian side provides a more stunning panorama, but the Argentine side has more vantage points from where you can actually get up close and personal with the falls. The Iguazú Falls are heralded as the most dramatic and among the most monumental waterfalls in the world, tumbling over the cliffs on the border with the Argentine province of Misiones and Brazilian state of Paraná. Voted as one of the Seven Natural Wonders of the World, the Iguazú Falls are undoubtedly the most visited place in Misiones and one of the most imposing natural attractions in the world. When you think of waterfalls, the first names that automatically come to mind are of the dramatic Niagara Falls and the magnificent Victoria Falls. Now, the Niagara Falls are undoubtedly the world’s most famous, the Victoria Falls are surely the world’s largest, but the Iguazú Falls are unhesitatingly the most impressive and exquisite! During a trip to Argentina, it’s something you just cannot miss! Also known as the Iguassu Falls and the Iguaçu Falls, the term Iguazú means ‘great waters’ in Tupi and Guarani language. Ancient Brazilian tribes always knew about these tumultuous thunderous falls, but it was little known worldwide until it was officially discovered by the European explorer and Spanish Conquistador Alvar Núñez Cabeza de Vaca in 1541. Today, the falls are owned by the two UNESCO World Heritage Sites – the Iguazú National Park in Argentina and the Iguaçu National Park in Brazil. Taller than Niagara and wider than Victoria, the Iguazú Falls are the result of a volcanic eruption that left a large crack in the earth. 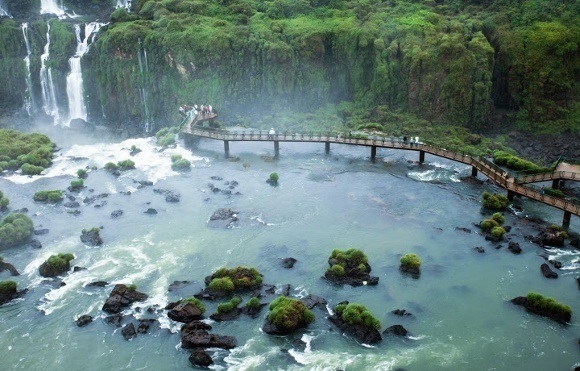 The waterfall system consists of 275 falls along 2.7 km (1.67 miles) of the Iguazú River. At an 80 meter canyon in the fierce foaming cauldron of the Devil’s Throat, the water produces a thundering sound. 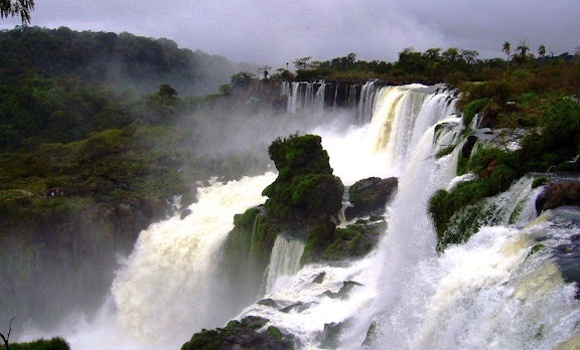 Here, several falls join together hurtling down a sheer drop, then draining into the Paraná river. Make a trip to Argentina during the spring and fall for the best views of the falls. So which is the better? The Argentine or Brazilian side? Both sides are simply wonderful, and it’s definitely worth seeing from both places. It all depends on what you want to see and how you want to do so – on ground or aerial. Two thirds of the falls are within the Argentine territory. If you wish to see and ‘feel’ the falls from a height, then that’s best done from the Argentine side. The Argentine side has two basic viewing circuits – an upper path and a lower path. The upper path offers exhilarating panoramic vistas and dizzying views from a footbridge/catwalk vantage point – truly an unforgettable experience! There may be some occasional mist. 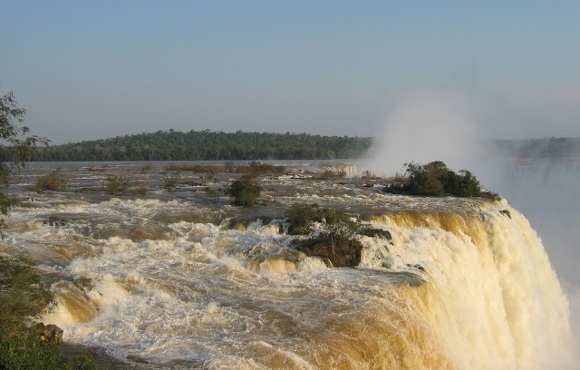 An aerial view lets you experience the sheer power and enormity of the falls. On the lower path leading to the base of the falls, the spray happily moistens you. This circuit also offers a boat trip to Isla San Martín. The Argentine side is ideal for seeing radiant poly-chromatic single or double rainbows. Brazil offers an astounding multi-dimensional panorama! If its picture-perfect views and flawless shutter exposures you want, then head on over to experience the falls from the Brazilian side. Consisting of a network of 275 waterfalls spanning an area of nearly 3 km wide, incredible vistas of the falls from virtually every angle in a 360° view takes your breath away! If you wish to enjoy a helicopter ride, then the Brazilian side is the place to do it. The Argentine side trumps with just that wee bit more to offer. 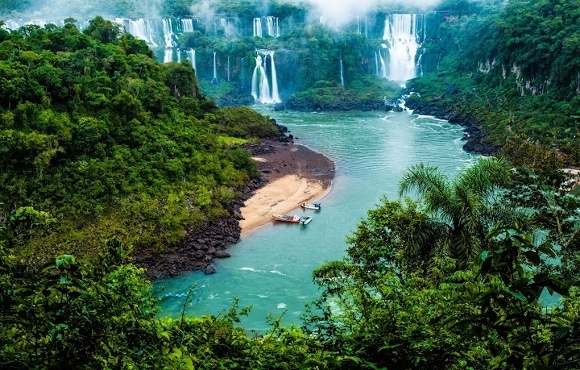 Although the Brazilian side may have fantastic views and give ideal photographic opportunities, the Argentine side trumps with just that wee bit more to offer – variety of vantage viewing points, easy travel trails and a choice of activities. The Iguazú Falls have earned such a reputation, that they have been featured in movies like – Mr. Magoo and Indiana Jones and The Kingdom of the Crystal Skull. Read more about the top 10 waterfalls in exotic destinations that you need to visit. 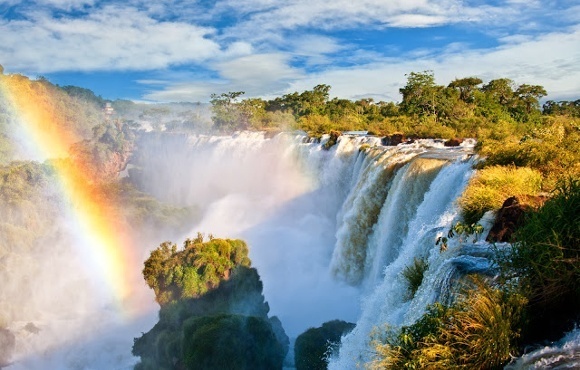 At Enchanting Travels, we help you spark an adventure and make memories all over the world – Iguazú Falls is just one such! Don’t just be a tourist, be a traveler!